Emerald was regarded as magical and mystical to ancient Egyptians. The Inca and Aztecs found great wealth in the abundant emeralds of the Yucatan. 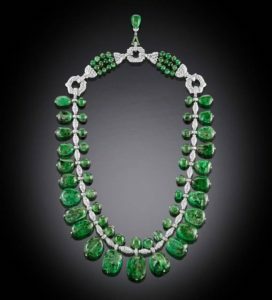 Eventually, Spaniards, who discovered the western hemisphere, returned to Europe with the finest emeralds they had ever seen. Hernando Cortes, the conqueror of Mexico, tried to bring huge chunks of Emerald that he took from the Aztecs back home with him. However, one of his ships was shipwrecked, and delicately carved Emeralds in the shape of flowers and fish and other rare Emeralds, including an Emerald the size of a man’s palm were lost forever. 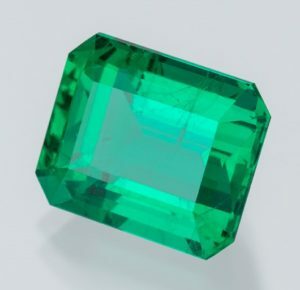 Colombia, Brazil, and Zambia are major sources of emerald. Colombia, however, is well known for the finest quality and commands a premium. Emeralds, by nature, are more heavily included than other gems. To find an eye-clean emerald is extremely rare. Zambian emerald rivals the saturation of Colombian emeralds. However, they tend to be darker in tone. Zambian emeralds are generally cleaner internally than Colombian, so they tend to be a great option for the middle price range. 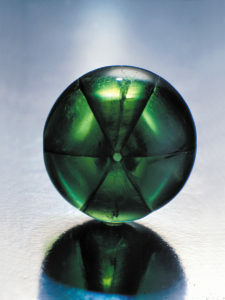 Brazil is the main source for commercial color emeralds. Washed out in appearance, they do have the redeeming quality of above-average clarity. Emeralds are routinely “oiled” to reduce the visibility of natural fractures within the stone. Oiling, and more recently Opticon (an epoxy resin), impregnation is an acceptable trade practice and has been for well more than a century. Occasionally, dye is added to the oil to enhance color. This is not considered acceptable in the trade. The emerald market suffered in the early 2000’s due to some controversy over oiling treatments, disclosure, and pricing of emeralds in relation to the extent of oiling. Prices fell 30%-50% and the market remained soft for several years until a recent resurgence. Emerald prices have just recently seen a full recovery from that downturn. Trapiche emeralds are an extremely rare variety of emerald. Cut in cabochon form, they display a hexagonal center with six radiating sections, following the growth of the original crystal. These rarities are found only in the Muzo mining district of Colombia. The Spanish name trapiche was attached to this unique gem due to its similarity in appearance to a wheel used for grinding sugar. A top quality trapiche emerald may display a glow or chatoyancy caused by fine needle-like inclusions. Emerald is May’s birthstone and represents the 20th and 35th wedding anniversaries. This gem can be worn in a ring, but special care is recommended in wearing. Emeralds should never be cleaned by ultrasonic or steamer. Soap and water with a toothbrush is the best cleaning method.